Image processing tool for Adobe Photoshop. Is there a better alternative to iAlterImage CS? Is iAlterImage CS really the best app in Image Editing category? Will iAlterImage CS work good on macOS 10.13.4? iAlterImage CS needs a review. Be the first to review this app and get the discussion started! 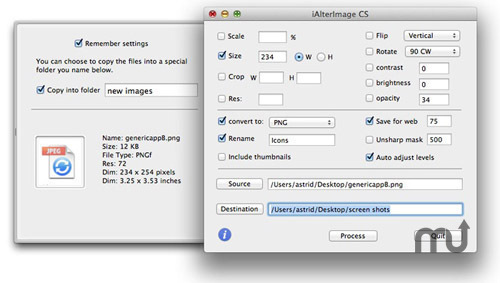 iAlterImage CS needs a rating. Be the first to rate this app and get the discussion started! iAlterImage CS is an image processing tool which works in conjunction with Adobe Photoshop. It leverages the excellent editing functions of Photoshop to scale, crop, flip, size, rename, change resolution, sharpen, and has adjustments for opacity, contrast, and brightness. It also uses the Photoshop "Save For Web" feature which reduces file size and optimizes images for the web. It can convert jpg, tif, png, bmp, psd, pdf, gif, pict, eps, and raw formats. A real time saver! Ideal for Web designers and graphics professionals who often need to process images or create thumbnails, and save time by not having to navigate in photoshop. It is simple and intuitive to use.